E-mail us or call (719) 539-9329 with questions. • october 23rd — criminal liability or lessons learned? Not every S-130/190 Basic Firefighter class gets a live-fire field exercise, but the April, 2017 students sure did. Thanks to Cori Coffin from KREX News Channel 5 in Grand Junction for her feature on Colorado Firecamp and learning lessons from fire tragedies like South Canyon and Yarnell Hill. Watch the story behind Colorado Firecamp's beetle-kill pine table, made by Corbin Clay of the Azure Furniture Company as part of Ketel One Vodka & GQ Magazine's “A Gentleman's Call” contest. Thanks, Corbin. Colorado Firecamp is a 501(c)(3) non-profit, wildland firefighter school, dedicated to expanding the opportunities for firefighters (and those who someday will be) to attend quality redcard wildfire training. We primarily offer 100- and 200- level courses developed by the National Wildfire Coordinating Group (NWCG) in the areas of leadership, incident command and suppression skills. 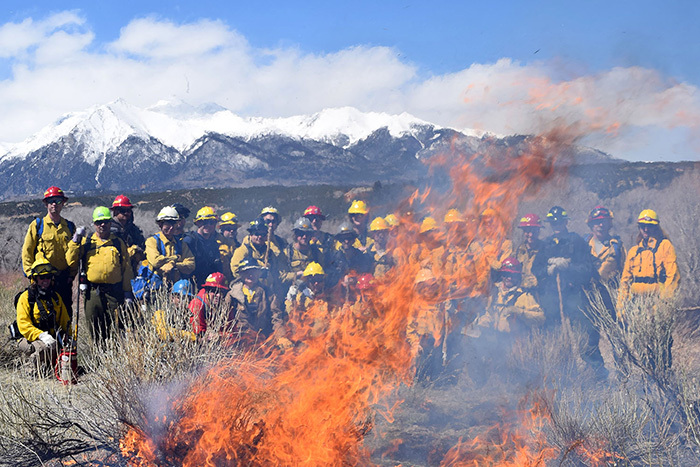 By working with local (Upper Arkansas Valley), zone (Pueblo dispatch) and regional (Rocky Mountain Area) training teams, Colorado Firecamp fills a niche in the wildland fire training market. We offer another option for fire management officers, fire chiefs, county sheriffs, and training officers to advance the skills of their firefighters. And, we give those without firefighting experience or previous firefighter training a chance to get a 'foot in the door' with the wildland agencies. Classes are taught using the conference facilities of the Ponderosa Lodge. Located 12 miles west of Salida, Colorado Firecamp sits in the middle of the Maysville-North Fork wildland/urban interface. Field exercises reinforce the classroom lessons. Keep updated with the Firecamp training schedule in Google Calendar or subscribe to our calendar in Microsoft Outlook 2007. Simply stated, the mission of Colorado Firecamp is centered on “keeping quality in qualification” of wildland firefighters.